The San Diegan, led by a pair of back-to-back ALCO PA units, reaches the end of the line at San Diego's Union Station on October 26, 1963. 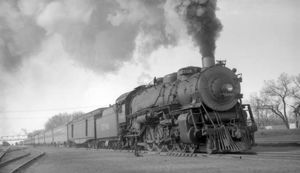 The named passenger trains of the Atchison, Topeka and Santa Fe Railway (AT&SF) included some fifty (50) regularly scheduled excursions operated by the company at various times throughout its existence. Named trains were often identified on the Santa Fe via illuminated "drumhead" signs mounted to the end of observation cars. Occasionally, "special" trains (not included in the railroad's regular revenue service lineup) were chartered to make high-profile runs over the company's trackage, usually for publicity purposes. A post-rebuild locomotive #1L, along with cabless unit #50A and an "E"-unit booster (center) lead the Chicagoan near Red Rock, Oklahoma in 1938. The Santa Fe's Grand Canyon Limited, led by EMD F7 #39C, stops at Joliet, Illinois in August 1963. Train No. 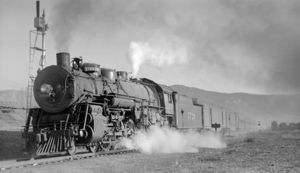 9, the Navajo, leaves Raton, New Mexico on April 9, 1939. The Atchison, Topeka and Santa Fe Railway's Train No. 1, the Scout, heads out of Belen, New Mexico on April 6, 1940. 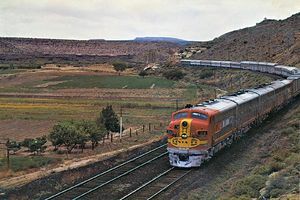 The San Francisco Chief travels through New Mexico with an EMD F7 in the lead. This train operated between Oakland (not actually San Francisco) and Chicago from June 6, 1954 to May 1, 1971, the date Amtrak began operation. A map depicting thhrough car lines along the "Grand Canyon Route" of the Atchison, Topeka and Santa Fe Railway, circa 1901. The California Limited operated between the cities of Chicago, Illinois and Los Angeles, California from November 27, 1892 to June 15, 1954, giving it the distinction of having the longest tenure of any train making the Chicago-Los Angeles run within the Santa Fe system. The Chicagoan operated between the cities of Chicago, Illinois and Wichita, Kansas (with a later extension to Oklahoma City, Oklahoma) from April 10, 1938 to April 18, 1968. The Chief operated between the cities of Chicago, Illinois and Los Angeles, California from November 14, 1926 to May 15, 1968. El Capitan operated between the cities of Chicago, Illinois and Los Angeles, California from February 20, 1938 to April 30, 1971, after which time passenger service on the line was taken over by Amtrak. The Golden Gate operated between the cities of Oakland and Los Angeles, California from July 1, 1938 to April 11, 1965. The Grand Canyon Limited (the name eventually being shortened to the Grand Canyon) operated between the cities of Chicago, Illinois and Los Angeles, California from June 29, 1929 to January 8, 1970. The Kansas Cityan operated between the cities of Chicago, Illinois and Wichita, Kansas (with a later extension to Oklahoma City, Oklahoma) from April 10, 1938 to April 18, 1968. The Navajo operated between the cities of Chicago, Illinois, Los Angeles, and San Francisco, California as a replacement for the railroad's Tourist Flyer from October 1, 1915 through January 14, 1940. The Overland Limited operated between the cities of Chicago, Illinois and Los Angeles, California from 1901 until 1915. 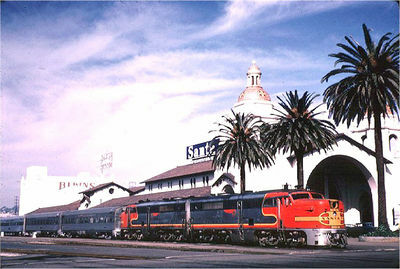 The San Diegan operated between the cities of Los Angeles and San Diego, California from March 27, 1938 to April 30, 1971, after which time passenger service on the line was taken over by Amtrak. The San Francisco Chief operated between the cities of San Francisco, California and Chicago, Illinois from June 6, 1954 to April 30, 1971. 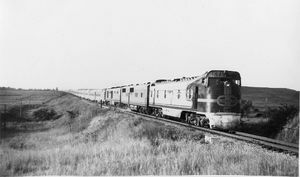 It was the last new streamliner introduced by the Santa Fe, the first direct service offered between Chicago and the Bay Area, the only direct service offered between those two locations over the tracks of a single railroad, and at 2,555 miles (4,112 km) the longest single service offered by a railroad in the United States which did not utilize another railroad's tracks. The de-Luxe operated between the cities of Chicago, Illinois and Los Angeles, California from December 12, 1911 to May 1, 1917. The Scout operated between the cities of Chicago, Illinois to Los Angeles, California from January 16, 1916 through June 7, 1948. 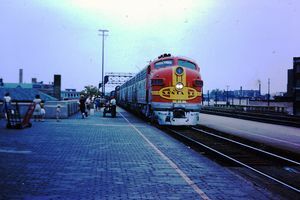 The Super Chief operated between the cities of Chicago, Illinois and Los Angeles, California from May 12, 1936 to April 30, 1971, after which time passenger service on the line was taken over by Amtrak. The Valley Flyer operated between the cities of Bakersfield and Oakland, California from June 11, 1939 to October 26, 1941. This page was last modified 15:30, 1 October 2014.